Val. 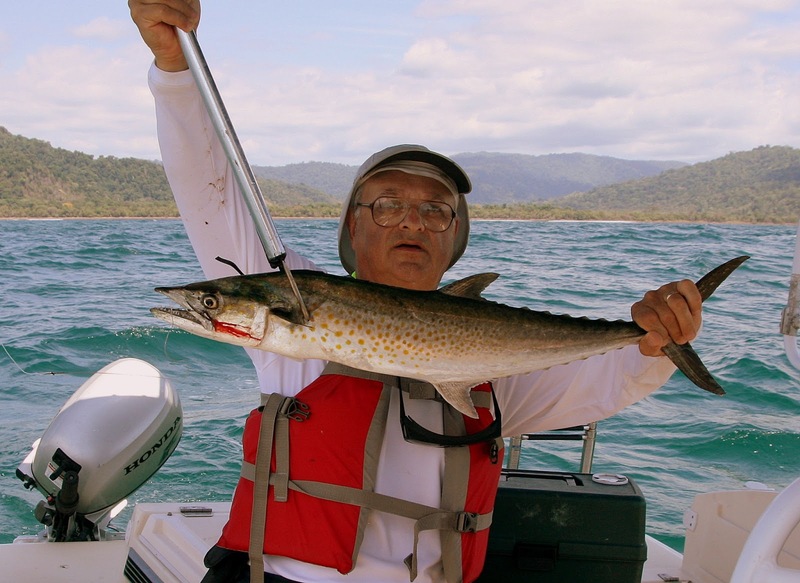 S., a frequent guest aboard Shoo-Fly, forwarded this photo to us from Costa Rica. Val says first they catch sardines with sabiki rigs, and then the live sardines are used for bait for larger fish, such as this King Mackerel. With the waves shown in the photo, we're glad to see Val wearing a life vest. Looks like fairly rugged country in the background. Based on the placement of the gaff, we can deduce that the mackerel is going home to be grilled for dinner. Val goes on to report: "There were huge schools of sardines all over. Like bunker in the 80's. 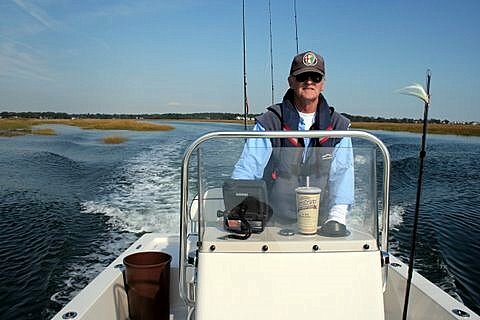 Macs and tuna were blitzing them like blues and stripers in the 80's. Pelicans, brown boobies, and frigate birds were swooping on them. I almost had a heart attack. :-) All of it in broad daylight. "If I had my cast net I could have had a livewell full of sardines on every cast. The captain caught them on a Sabiki rig with bare hooks which was difficult. Next time I will bring several Sabikis with the fly-like hooks we use for herring. "Now I know how spectacular fishing can be in Costa Rica with the right equipment. I wish I had my fly rod. These Macs fought like tigers. We also caught a Yellow Jack. Yeehaa."